The project aims to analyse and develop core virtues of social workers to strengthen the social fabric of individuals, families and communities. The increasing demand for sound judgement and appropriate decision making, often in the unpredictable and uncertain contexts, necessitates a focus on virtue-led social workers' action. The interdisciplinary and mixed method analysis will demonstrate the largely neglected role of virtues and/or character dispositions in facilitating improved social services and in building stronger communities. The research will have both theoretical and practical implications for virtue-led social work practice that will result in communities living healthy, productive and fulfilling lives. to develop approaches to cultivating core virtues in their (professional) socialisation so as to ensure better outcomes from the profession for its clients and communities. What are the core virtues which need to be used in social work practice? Do social workers use the virtues in their practice? How do social workers develop and demonstrate their virtues in practice? What roles do virtues and character play in social workers' practice outcomes? Will the conscious development and use of virtues and character result in sound judgements, appropriate decisions and better social work practice outcomes? How should social workers go about improving their virtues and overcoming virtue flaws/deficiencies? Why does the social work profession not draw more on virtue ethics? By employing a combination of both qualitative and quantitative research methods, the research is being conducted in three phases. Phase I: Biographic data collection and analysis and a workshop with a view to develop ten biographies of social workers and identify virtues in their practice; Phase II: Data collection from social workers, social work supervisors and social work ethics educators to explore whether and how social workers develop and apply virtues in their practice; and Phase III: Data analysis, report writing publication and dissemination. 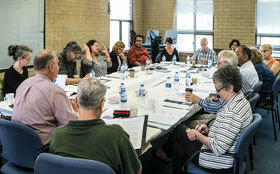 A first phase of the ARC discovery project culminated into a two days workshop (10-11 December 2014) held at Wagga Wagga campus, bringing together eminent social work and philosophy academics from nine Australian universities. Participants critically discussed virtues in ten biographies of Australian social workers and provided rich data for further analysis and interpretation. The workshop was led by CIs, Prof. Manohar Pawar (CSU), Prof. Richard Hugman (UNSW); Mr. Andrew Alexandra (Melbourne Uni) and A/Prof. 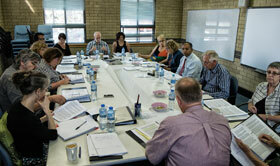 Bill Anscombe (CSU), who are finalising biographies to be published as an edited book. The successful completion of the first phase of the project has led to second phase of the project in which data is being collected from social work practitioners. The CIs look forward to sharing the results of the project in the near future. These outcomes are likely to impact the ways of thinking and doing of social workers; raise the awareness of virtue-led practice and improvement in decisions and the quality of practice; and advance the knowledge base and orientation of the social work profession towards a new paradigm in social work education and practice.